THE DIRECTOR OF the Ana Liffey Drug Project has rejected suggestions that the drug problem in Dublin’s city centre has gotten worse, saying rather that it has moved and changed, as is the nature of the illegal drugs industry. 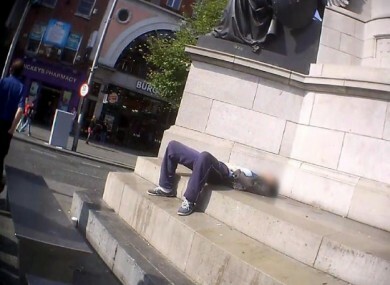 A report featured in last night’s RTÉ Prime Time suggested the scale of drug-taking and anti-social behaviour in the city during the day time has increased. Garda detection numbers for sale and possession of drugs are up significantly but Ana Liffey’s Tony Duffin told TheJournal.ie that this does not necessarily mean things are worse now. Drug trends themselves have changed too in the city, as Duffin explained a recent surge in people injecting drugs that were sold as crystal meth and are in fact different forms of stimulants and hallucinogenics. Though Duffin conceded there can sometimes be little empathy for the plight of addicts, he stressed that the best solution for this problem lies in helping these people to be safe and to eventually overcome their dependence on drugs or alcohol. There’s a need for the central government to invest in treatment and rehabilitation for people. That treatment should be person-centred and accessible. But we need a joined approach, we at Ana Liffey work with gardaí and that needs to happen across the board – a joint up approach. Like others working in this area, he said injection centres would be a considerable resource, as well as residential crisis stabilsation units. “We want to make sure people are safe while using drugs and, while doing that, constantly look to treat and rehabilitate them so they can stabilise, become drugs free and live a safer, healthier life,” he added. Email “Dublin's drug situation hasn't gotten worse, it's just 'shifted to other areas'”. Feedback on “Dublin's drug situation hasn't gotten worse, it's just 'shifted to other areas'”.